CHICAGO -- Matt McQuaid scored a career-high 27 points, Cassius Winston converted the go-ahead layup in the closing minute, and No. 6 Michigan State rallied to beat No. 10 Michigan 65-60 for its sixth Big Ten Tournament championship on Sunday. 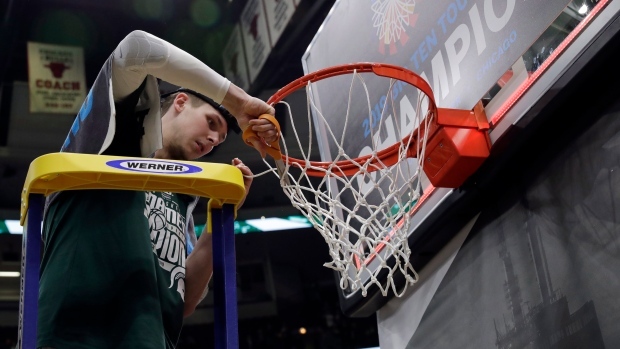 The top-seeded Spartans (28-6) rallied from a 13-point deficit in the second half and scored the game's final 10 points to capture their first championship since 2016. No other program has won the tournament as many times as Michigan State, and this one was particularly sweet. After all, the Spartans prevented a championship three-peat by Michigan (28-6) and beat their rivals for the third time this season. McQuaid nailed a personal-best seven 3-pointers. Winston, the Big Ten Player of the Year, had 14 points and 11 assists as Michigan State won for the 10th time in 11 games. The Spartans were awarded a No. 2 seed in the NCAA Tournament and will face Bradley in the second round on Thursday in Des Moines, Iowa. Ignas Brazdeikas led Michigan with 19 points. Jordan Poole scored 13. Jon Teske had 10 points and 10 rebounds. Zavier Simpson added 10 assists. But the third-seeded Wolverines fell again to Michigan State after blowing their chance to win the league by losing to their rivals twice in the final four regular-season games. Michigan led by 13 early in the second half, but Michigan State went on a 13-4 run to tie it at 48 with just over seven minutes remaining. The Wolverines were up 60-55 after Livers hit a 3 with 2:29 left. But McQuaid answered with one of his own to start the game-ending run and Xavier Tillmanmade a tying layup for Michigan State. After Simpson missed a 3 for Michigan, Winston drove to his left for a layup to put the Spartans on top 62-60 with 28 seconds left. Brazdeikas then missed a pull-up jumper that got tipped by Aaron Henry with 14 seconds to play. Teske and Tillman went up for the rebound, the ball got tipped out of bounds and the referees gave possession to Michigan State after a review as Michigan coach John Beilein screamed on the sideline. Henry made a free throw and missed hit the second, making it a three-point game. Poole then appeared to get bumped by Winston -- Michigan State had a foul to give -- as he launched a long 3 off the dribble, but there was no call. The Spartans' Kenny Goins hit two free throws to make it 65-60 with two seconds left. Michigan State forward Kyle Ahrens was taken from the court on a stretcher with a left leg injury in the first half. Michigan: The Wolverines have their sights set on another big NCAA run after losing to Villanova in the championship game last year. Michigan State: The Spartans head to the tournament with high hopes, though their rotation figures to be a little thinner after Ahrens went down.